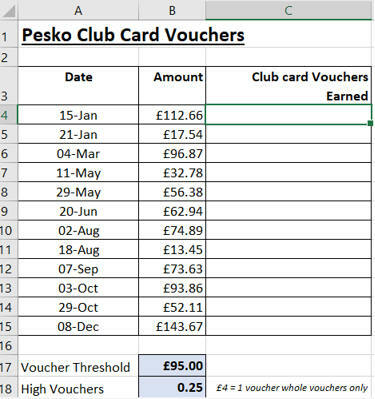 We want to calculate the number of club card vouchers earned. Don't forget to set up range names for the input cells containing the high and low voucher amounts and the voucher threshold figures. 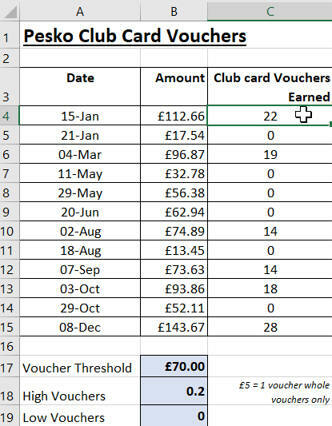 Copy your =IF function down the column to calculate the other club card vouchers earned. When you change the input cell values, the answers in column C should change. Use Save As... to save the file in your new Excel work folder.